Afternoons with your child were happy and relaxed, and not so busy and overwhelming? You knew how to handle your child’s after school attitude with ease? You didn’t have to nag about backpacks, homework, and bad attitudes? After school time should be fun. Your child has been gone all day at school and you’re excited to see them again. But instead of being greeted with warm hugs and stories of their day, your child comes home tired and irritable. Then you have to nag them to put away their backpacks, get the homework done, and to stop yelling at their brother! After a while, you don’t really like the afternoons with your kids. It’s just so hard. You want the afternoons to be great. You want to enjoy this time with your kids. The After School Handbook can help. 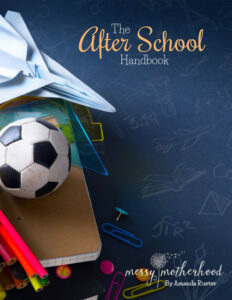 The After School Handbook is a guide for moms that want to enjoy the afternoons with their kids, without the nagging, yelling, and reminding. Create an after school routine that works for your family. Manage homework battles with ease. Build stronger connections with your child, even when they’re at school. Start meaningful conversations with your child so you really know how their day went. Understand why your child falls apart after school and get proven tips to help them cope. Get all this and more in these 28 Printable Pages.